The "Tail" of Tiny Tim - Holyland Donkey Haven Inc.
JULY 2012: On July 1st, 2012 I received a phone call from Columbus, WI. A woman came home to find a donkey tied to a tree in her front lawn. Her friend rescued him from his owners, who were going to shoot him because he has a deformed right hind leg. She was told that he had this as a result of a birth defect that only grew worse as he aged (he is now 2 years old). On July 2nd, he arrived at our sanctuary in Mt. Calvary WI. This sweet little donkey didn't even have a name. He learned how to walk with his deformed leg and has a very strong will to live. Tiny Tim was extremely malnourished and suffering from stunted growth. When offered grain and a cut up apple, Tiny Tim didn't know what it was. For an entire day, the uneaten grain and apple lay in his food dish. He now eats everything given to him!!! The UW vet team took many x-rays & agreed to take a CT Scan. The doctors were in agreement that if his leg had been operated on shortly after birth, it would have been a simplier procedure and his recovery much quicker. There is something that can be done to help him! We are at the point where we need all the help we can get. His operation is going to be very expensive (No actual cost to date). The clinic cost is estimated at $8,000.00. PLEASE call with your donations! The veterinary clinic is accepting donations directly at (608)263-7600 (#3 on the phone menu). You can use your debit or credit card. Please let Kim know that you wish to make a donation for Tiny Tim, the donkey. She will answer any questions you may have at that time. You can also send a check to Holyland Donkey Haven. 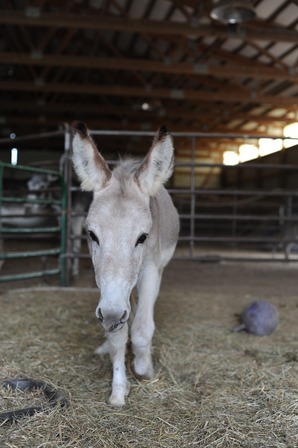 PLEASE~every dollar helps this sweet little donkey. If he doesn't have the operation, as he ages, he will be in so much pain that humane euthanasia will be his only option. Tim has the capacity to live to be 50 years old and have a high quality of life after this operation. 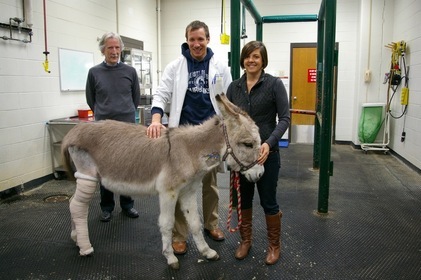 NOVEMBER 2012: Tiny Tim was operated on by Dr. Samantha Morello and her team of surgeons. The surgery was a success! He is now at home recuperating. He will be going back monthly to check the status of the healing. We want to thank everyone who sent in contributions! A special THANK YOU to Flint Grahl, who truly gave from his heart and made it possible for us to have all the money needed for this monumental operation ($8,000.00). It will take about 4 to 5 months of rehabilitation before full healing will take place. He has embraced all the changes very well and is playing with his joly ball again! 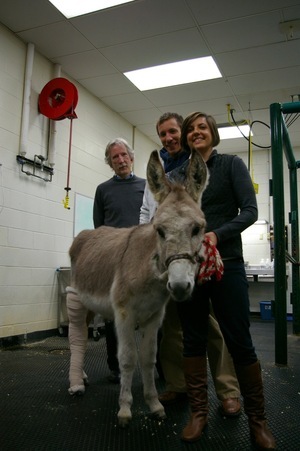 ​​​​​​​​​​​​UW-Madison Veterinary School's team that coordinated Tiny Tim's operation! Starting from right to left: Dr. Sam Morello, Dr. Jason Bleedorn and Dr. Peter Muir. Thank you very much for helping with our little guy! DECEMBER 2014: Tiny Tim is thriving in his role as Holyland Mascot! He loves the attention from visitors and has grown into a strong and handsome young man! He will always need extra care and appreciates any sponsorships he may receive. Thanks to everyone for continuing to support Tiny Tim!